Over the years Ralphs and Food for Less have supported Founders MCCLA through their community program. Even if are already registered to support Founders MCCLA every time you shop, once a year you need to re-register. If you are not already registered, please do so now and help us to help others. Just follow the steps to the right and start saving and start giving! 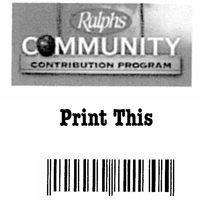 Print this form, fill it out, bring it to a Ralphs Store and present it to any cashier. Most participants are new online customers, so they must click on “Sign Up Today” in the “New Customer?” box. Sign up for a Ralphs Account by entering your zip code, clicking on favorite store, entering your email address, creating a password and agreeing to the terms and conditions. To verify you are enrolled correctly, you will see MCCLA’s name on the right.